Grew up… Jon Osterman, the son of a watchmaker, and graduate from Princeton University as an atomic physicist. Living… on Mars. While working in an intrinsic field experiment test chamber, he left the watch of his lover and fellow scientist, Janey Slater, in the chamber and went after it. The door shut on him, and the experiment could not be overrided. Jon was violently vaporized by the energy of the experiment. Now he has changed and exiled himself to the cosmos. Profession… former atomic physicist turned god-like, blue superhero. After the accident, Jon is able to reassemble himself into a hairless, blue, shiny, levitating entity. Experiencing time non-linearly, Dr. Manhattan’s mind can reach conclusions most humans cannot even imagine. 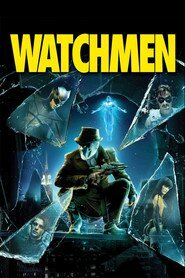 Interests… fighting crime for the government, he is given the codename Doctor Manhattan. Although he feels that fighting for humans is almost a pointless endeavor, he uses his near limitless abilities to help the U.S. by almost single-handedly winning the Vietnam war, and becomes the nation's greatest defense against a nuclear attack. Relationship Status… in a complicated relationship. After dating Janey, he started seeing a fellow member of the Crimebusters superhero organization: the Silk Spectre II, Laurie. But due to his increasing disinterest in human life, he struggled to keep their relationship stable. Challenge… determining whether or not he should help rescue the world from total nuclear annihilation. He sees all of time at once and it gives him a unique perspective on what seems like an obvious question. Personality… distant, aloof, and philosophical. With powers and capabilities so great, it's hard for him to connect with the human race. At one point he coldly tells Laurie, "We are all puppets, Laurie. I'm just the puppet who can see the strings." Dr. Manhattan 's popularity ranking on CharacTour is #481 out of 5,000+ characters. See our top-ranked characters and read their profiles.